Arsenal’s teenage sensation Emile Smith-Rowe got himself on the scoresheet for the Gunners in their Carabao Cup tie against Blackpool this evening. 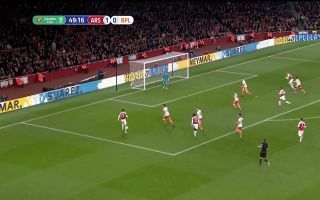 In the 49th minute of the tie Smith-Rowe finished off a great counter-attack from Arsenal by volleying the ball into the ground before it hit the back of the net. Smith-Rowe has an unlikely culprit to thank for his first goal at the Emirates, Carl Jenkinson who made his first appearance for the Gunners in 701 days, lifted the ball into the six yard box leaving Smith-Rowe free to hammer the ball home. Arsenal fans can be excited with the young talent at the club. Smith-Rowe has delivered great performances when called upon, Matteo Guendouzi is quickly turning into a first-team regular and academy graduates Alex Iwobi, Ainsley Maitland-Niles and Hector Bellerin are all featuring for the first team.